Today's hardwood floors are more versatile than ever because of increased design options including a variety of finishes and different plank widths. Their natural beauty creates a timeless, elegant floor with durability that provides a good long-term investment for any homeowner. Despite all of these positive design features, that doesn't mean solid hardwood floors are the best choice for every room in your house. Before you start shopping, learn where hardwood makes the most sense for your lifestyle and home environment. 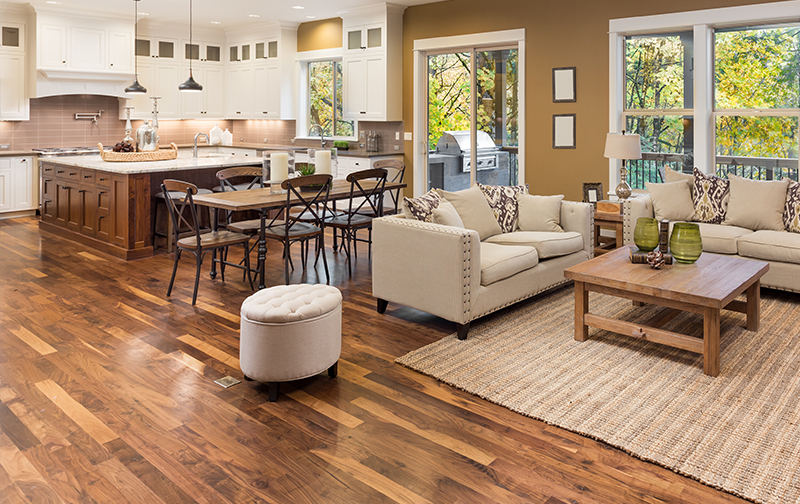 There are many reasons why so many buyers are drawn to hardwood floors. They are warm and inviting, which creates a sense of quality and beauty. They also give the impression of permanence and strength. Every type of hardwood flooring material has a different look because of natural grain patterns. That’s a special feature that only comes with using a natural material. The pinholes, knots, and whirls within hardwood planks tell a story. Whether you pick a hardwood flooring option with a subtle or bold grain patterns, your floors will have have something to say. Cost: They can be pricey; exotic hardwoods even more so. Sound absorption: They can often be too noisy, but area rugs can help control echoing. Water: They don’t work well in moisture-rich environments, like bathrooms or basements. Hardwood flooring create stunning living areas, but they are not what most people consider comfortable underfoot. Incorporate an area rug into a room with hardwood floors to add a bit of style and help absorb echoes that often accompany hard surface flooring. Need help determining where to put an area rug in your room? Download the free Kermans area rug placement guide. If you’re considering hardwood flooring for your home, stop by our showroom in Indianapolis. Kermans carries a wide range of hardwood flooring, including exotic hardwoods. When you shop at Kermans, you’ll always receive every benefits of the Kermans Advantage: expert consultants, unparalleled customer service, and sound recommendations. Which floors are best for those with allergies?